New Orleans' history is told in its storied streets. As expected, the names of streets in New Orleans all have some sort of meaning. We can't cover every street name, but here's the history of why some are named what they are. Everyone who knows about New Orleans knows about Bourbon Street. But did you think that street was named after an alcoholic beverage? If so, you might be surprised to know the real story. Bourbon, like other streets in the French Quarter, is named after one of the royal houses of France at the time the French Quarter was laid out in the 1700's. Another example is Burgundy, named for the Duke of Burgundy who was King Louis XV of France's father. 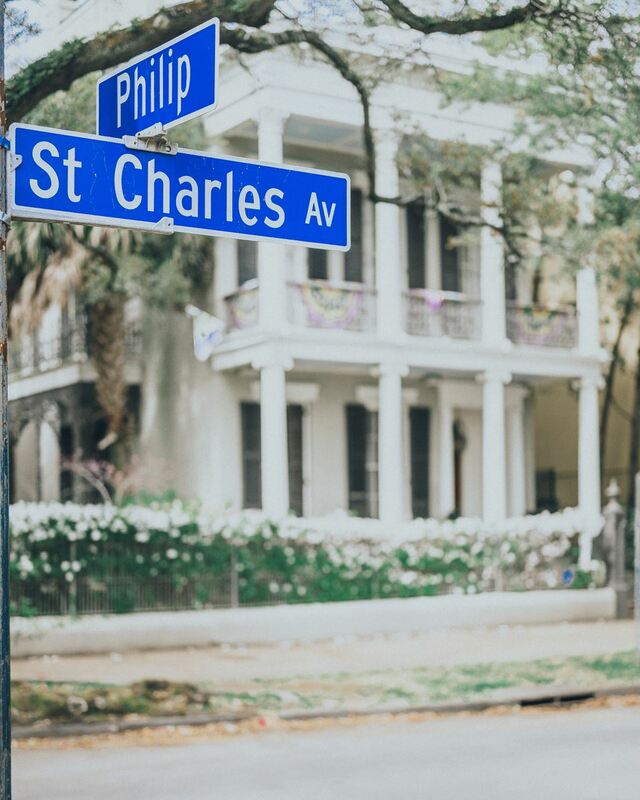 Other French Quarter streets are named after Catholic Saints, like St.
Ann and St. Louis, St. Peter and St. Philip. Canal Street, at the upriver end of the French Quarter, is one of the widest streets in the country. That's because it is a dividing line between two cultures. The original French and Spanish settlers who lived in the French Quarter were not amused when Americans began to arrive and settle in New Orleans after the Louisiana Purchase. So, they built a very wide expanse to separate the Creoles from the Americans. Although a canal was intended for the area, it was never actually constructed. Have you ever noticed that none of the French Quarter Streets cross Canal Street? Bourbon becomes Carondelet, Royal becomes St. Charles, Chartres becomes Camp, Decatur becomes Magazine. That's because the Americans had to name their own streets in the American Sector, they could not use the French Quarter street names. The French and Spanish could live together, but they would not be forced to live with the Americans or the English. They wanted the division of Canal Street to be obvious. New Orleans has several classically named streets. Dryades is named for the wood nymphs and was the wooded side of town when it was named in the 19th century. The Greek muses are well represented around Coliseum Square in the Lower Garden District where nine streets named for the Muses cross Prytania Street. Prytania was originally Rue du Prytanee, named for the Prytaneum, the hearth that each ancient Greek village had dedicated to the goddess of the hearth, Hestia. Further uptown Napoleon Avenue crosses St. Charles Avenue. Napoleon is, of course, named after Napoleon Bonaparte. Several of the streets nearby are named after the sites of Napoleon’s greatest victories, Milan, Austerlitz, Marengo, Berlin, and Constantinople. However, after World War I, Berlin Street was re-named 'General Pershing'. There is also a Valence, a Lyon, and a Bordeaux Street, all French cities that are closely associated with Napoleon. How Do You Spell It, How Do You Pronounce It? One of the streets we have the most fun with is Tchoupitoulas. It’s one of the longest streets in the city, stretching over five miles along the Mississippi River. How it got its name is debatable. There are Tchoupitoulas Indians, but there’s some solid evidence that the French gave that name to the Native Americans living in the area. After all this lower Mississippi Valley was the ancient territory of the Choctaw. It seems the Native Americans, who lived on the river, caught a mudfish the French called the “Choupic.” Over the centuries, Tchoupitoulas has had several different spellings. What Is the History of the Sultan's Palace in New Orleans?